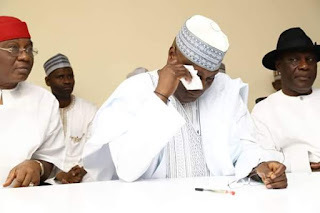 Former Vice President, Atiku Abubakar, on Friday betrayed emotions as he wept openly over the sorry state of the nation where he received the nomination form to vie for the presidency under the platform of the Peoples Democratic Party, PDP, bought by his support group with a vow to restore sanity to the land if elected the President come 2019. 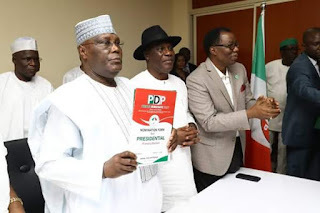 Speaking in Abuja today after Atiku Support group, a movement drumming support for his presidential candidature handed him the Expression of Interest and Nomination forms bought on his behalf to him for the presidential race, Atiku lamented the hopelessness in the country and assured that he was in the race to restore the lost glory of the nation which the ruling All Progressives Congress, APC, had failed to do as earlier promised. He declared that the presentation of the nomination and expression of interest form was significant and historic because it was the first time in his political career that young men and women in the country would come together without his knowledge and consent to contribute their hard earned money to buy him to the forms. According to him, “it is almost three decades of my political career this year. But today has also turned out to be one of the most emotional days in those three decades of my political career. I have tried to present myself as a candidate for the office of the president in a number of elections. The only time I succeeded in being on the ballot was in 2007. He pointed out that addressing the challenges‎ confronting the country was a possible task which must be done as the nation had a lot of young people who have gotten the talents, education, and experience to turn the country around. “I hope this endeavours of ours will result in a success in the nomination and of course subsequently in the general election so that together we can work. The undertaking I’m going to give you is that it is our job together, and I promised you‎ we are going to doing it together. 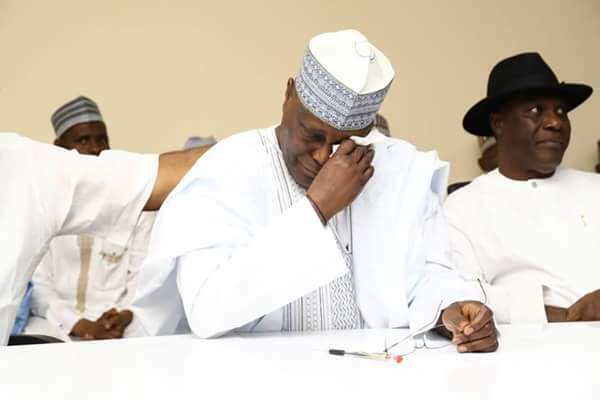 Atiku recalled that he was brought into politic as a young man by the Late Musa Yar’dua who urged them to break the regional siege that every part of the county had been subjected to which he said prompted all his actions in his political career in life. Earlier in his remarks, Princess Adekemi Adesanya on behalf of Atiku Support Group said that visionless leadership and bad economic policies were responsible for the present contraption in the nation’s economy. Also, Speaking at the occasion, the National Co-ordinator ‎of Atiku Abubakar Support Group, Hon Oladimeji Fabayi said that the various groups drumming supports for the Wazirin Adamawa decided to purchase to forms based on their conviction that he was capable of restoring sanity back to the country with his wealth of experience. Meanwhile, the President of the Senate, Senator Bukola Saraki also purchase his nomination and expression of interest forms for the Presidential race under the Party. Senator Saraki eventually purchased the forms late yesterday ‎through the Director General of his Presidential Campaign Organization, Alhaji Mohammed Wakili, after two attempts earlier in the day were put off.